* One third of each unit is dedicated to skills training. The step-by-step approach focuses on writing and early literacy skills to build children's confidence in reading, writing, speaking, and understanding English. * One in six lessons is a phonics lesson to train children to recognize and produce English sounds. At levels 1-3 the lessons are supported by flashcards, and by more activities on the Student MultiROM. * The civic education syllabus educates children in good values and behaviour. The Photocopy Masters Books at levels 1-2 include 15 values worksheets. * The Testing and Evaluation Book and the test builder element of the Teacher's Resource CD-ROM help teachers to evaluate children's progress. * One lesson per page with clear lesson objectives makes the course easy to teach. 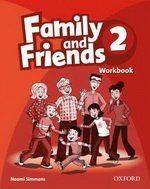 * Accompanying resources, including the Grammar Friends series, skills series, Teacher's Resource Pack, course readers, and Teacher Resource CD-ROM allow teachers to focus on additional skills training and means the course can fit different teaching programmes per week.